Sharjah, United Arab Emirates: Talah Board announced its ‘Cash-for-palm-waste’ initiative at the Dibba Palm Exhibition, which is taking place from the 12th to 15th October. The industrial company is encouraging farming and agricultural entities to register their participation while at the Dibba Exhibition. This opportunity will help the date palm industry discard of palm tree trimmings sustainably and in compliance with the environmental laws of UAE. 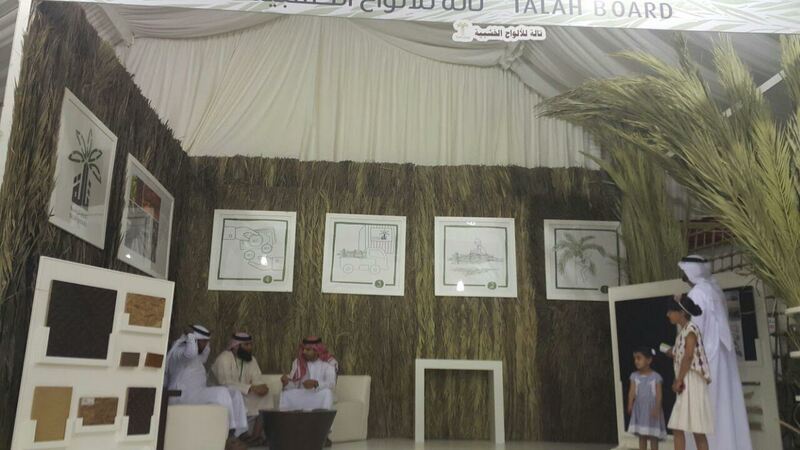 Talah Board will offer AED85 per tonne of palm waste. The waste can be deposited at a Talah Board palm collection site, or will be picked up by the company if the waste exceeds a certain quantity. Talah Board will recycle the date palm tree trimmings into high quality wooden board products to answer the demand for this product in UAE and regional markets. On a yearly basis, the UAE produces 500,000 tonnes of palm waste; roughly ten percent is required annually for Talah Board’s industrial operation. The company’s operations are aligned with both the UAE Vision 2021 and the Abu Dhabi Vision 2030 in terms of bringing sustainable and industrial innovation to a non-oil sector. Talah Board is an innovative industrial company that recycles date palm tree waste into wooden board products for the local market. The company is the creation of two major players in their respective markets, ECC Group in the UAE and BINOS GmbH in Germany. ECC is a local contracting company known for several landmark projects in the country, and BINOS GmbH is a world-leading panel plant manufacturer from Germany. Talah Board’s Chairman, Hatem Farah, realized the inherent strength in the fibers of the annual palm tree trimmings (waste) and their abundance. He also recognized the economic opportunity to replace the importation of wooden boards into the region with a locally-made, high quality alternative. To bring this opportunity to life, ECC employed the services of BINOS to carry out the research and development necessary to produce these wooden board products. Once equipped with the technology necessary for production, Talah Board began its mission to collect the leaves (fronds) and fruit stems of the palm tree to amass its raw material. The industrial company requires roughly 10% of the country’s palm waste annually. Astonishingly, the UAE alone creates more than 500,000 tonnes of palm waste every year. Talah Board is a registered company in KIZAD industrial zone in Abu Dhabi. The 56,000 m2 factory is expected to be completed by Q3 2017 with an estimated capacity of 75,000 cubic metres of wooden board products per year.